Chryse /ˈkraɪsi, ˈkraɪzi/ (Greek: Χρύση, translit. Khrúsē, lit. 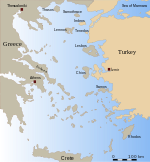 'Golden') was a small island in the Aegean Sea mentioned by Homer, Sophocles and Pausanias. The island's main feature was said to be its temple to Apollo, and its patron deity a goddess named Chryse. The Greek archer Philoctetes stopped there on his way to Troy and was fatally bitten by a viper. Lucullus captured three men there in an ambush during the Third Mithridatic War. The island seems to have disappeared by the 2nd century AD; it is mentioned by Pausanias  and Appian. An ancient oracle (written by Onomacritus) may have predicted this end. ^ Gillies, John (1820). "XXVII: From Alexander to Augustus". The history of ancient Greece: its colonies and conquests; from the earliest accounts till the division of the Macedonian empire in the East. Including the history of literature, philosophy, and the fine arts, Volume 4, Part 2. 4. T. Cadell and W. Davies. p. 249. ^ Mithridat. c. 72 et seq. ^ Javier Martínez, "Onomacritus the Forger, Hipparchus' Scapegoat? ", in Fakes and Forgers of Classical Literature, Madrid, 2011, p. 225, ISBN 84-7882-725-0. ^ "Philoctetes Was Here". TIME. December 19, 1960. ^ Harrison, S. J. (1 January 1989). "Sophocles and the Cult of Philoctetes". The Journal of Hellenic Studies. 109: 173–175. doi:10.2307/632045. JSTOR 632045.